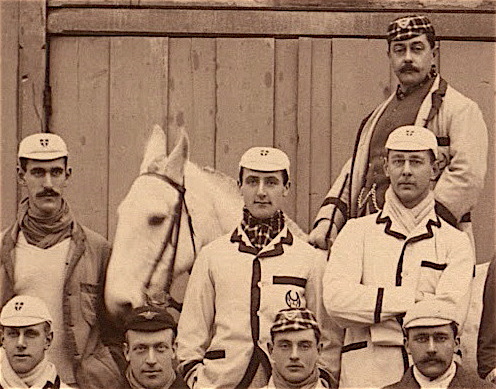 The wonderful picture of the Cambridge Trial Eights crews for 1896 published on HTBS on 23 November showed the coach, Henry Trevor-Jones, on his horse, Sultan. Another picture of the pair (four years later) is on the boat club website for Christ’s College, Cambridge. I would imagine that, certainly up to the 1914–1918 War and perhaps up to the 1939–1945 War, coaching from horseback was a common thing. 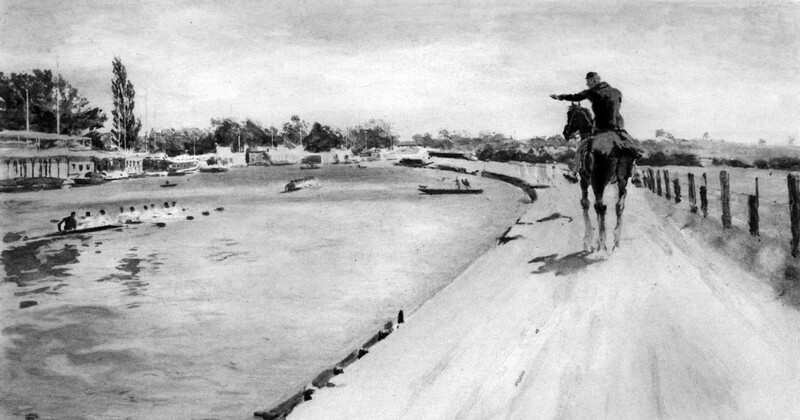 Horses were freely available, required less concentration and effort to manoeuvre than a bicycle and afforded a high vantage point. Even when outboard motors became available and affordable to rowing clubs, they could not be used on narrow rivers like the Cam and the Isis and coaching from the bank was (and is) the only option. The ‘Wikibook’, The Rowers of Vanity Fair, has a couple of nice pictures showing mounted coaches. 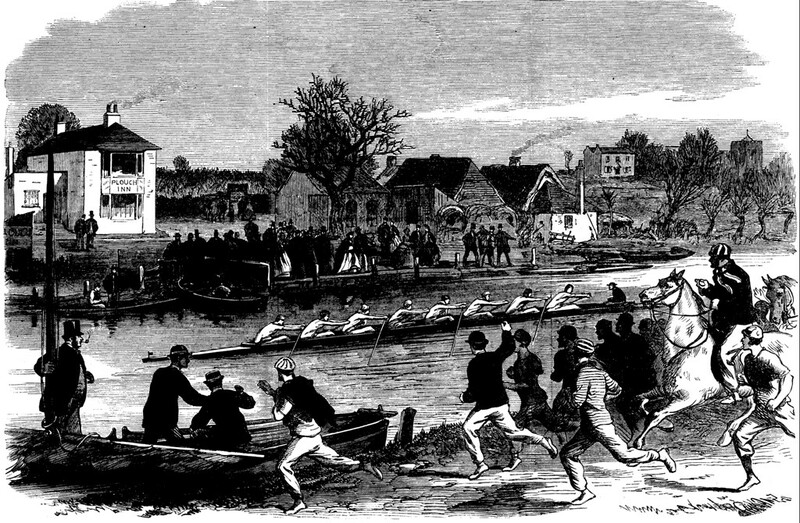 Coaching at Cambridge 1866. From The Rowers of Vanity Fair. Coaching at Oxford, c.1897. From The Rowers of Vanity Fair. My favourite such picture, however, must be In The Golden Days (1900) by Hugh Riviere which forms part of the War Memorial at Thames Rowing Club. The ever reliable British Pathe site has a few examples of horses on the tow path at Oxford and Cambridge in the 1920s and 1930s. A couple of steeds can be seen in this 1939 example from the Cambridge Lent Bumps. Mounted coaching may have been indirectly responsible for one of the peculiarities of Henley Royal Regatta. The first official timing point on the course is ‘The Barrier’, a seemingly random 2,089 feet from the start. I have always understood that this was the ‘Horse Barrier’ beyond which coaches were not allowed to ride. It would be interesting to find out who was the last person to coach from horseback and when. Perhaps someone still does? Does any HTBS reader think they know?